Historical archives are increasingly being made available online. Often they contain photos, newspapers and legal documents. But what about the sounds of the past? The University of Auckland is curating and digitising audio from years gone by, with a focus on Māori and Pacific island cultural recordings. It's not a simple challenge. First, the background. Māori and Pacific island culture is considered indigenous to New Zealand. While there's some academic debate about whether other races were present on these islands at an earlier time, the Māori were the predominant people here when Captain Cook landed in 1769. 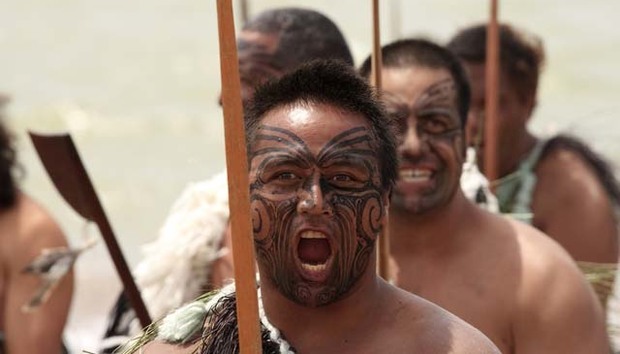 In contrast to many other countries, the European visitors didn't immediately proceed to subdue, enslave or marginalise the locals, perhaps partly because the Māori were fierce warriors with proud traditions and effective weaponry. (The Haka, performed at the start of international rugby matches by the All Blacks team, is fundamentally a war dance designed to intimidate the opposition. It's scary enough without weapons). With mutual respect, the Treaty of Waitangi was signed in 1840. I'm simplifying for the sake of brevity, but the upshot is a mix of cultures that, speaking as an immigrant here, is eminently sensible. There are, of course, grumbles on both sides: for example, some Māori want more rights over what they see as their land, some Europeans want less focus on Māori culture being taught in schools. On the whole, though, it works. There's no central repository of Māori and Pacific island cultural history in New Zealand, but there are institutions dotted around the country with their own collections. Most deal with photographs and written records, including legal documents. But Nigel Champion, manager and audio conservator at the Archive of Māori and Pacific Music at the University of Auckland, looks after a different type of history: the sounds of the past. Original research recordings (mainly audio on open-reel tapes and audio cassette) made by ethnomusicologists, linguists and social anthropologists, many of them Māori. Copies of early recordings, including cylinders and transcription discs, held by other institutions, both in New Zealand and abroad. Analogue recordings from Pacific radio stations, the Archive having long provided assistance to radio organisations through training, digitisation and the supply of resources. Commercial audio products such as 78s, vinyl records, cassettes and CDs, purchased for teaching and research purposes. Why the predominance of audio recordings? According to Champion, "Until compact, modestly-priced video cameras (Video8, Hi8, MiniDV, etc.) became available, video was generally too difficult and expensive for use by academic researchers in a Pacific setting." Ownership of all this stored material is retained by the original artist or the archive depositor, as appropriate, and access is restricted according to their wishes. As Champion explains, "It would be disrespectful use of such culturally rich material (i.e. indigenous knowledge) to simply upload all digitised files for completely open internet access. [But] digital copies have been supplied in volume to a number of iwi [tribe] organisations to assist with Treaty [of Waitangi] claims"
Whenever copies are requested and permission granted, internet downloads have recently replaced cassettes and CD-R as the preferred distribution medium. This also allows the Māori diaspora and overseas scholars to access the Archive more easily. Like any other form of data archival, part of the challenge is preventing decay and deterioration. The Archive has climate-controlled storage conditions appropriate for magnetic tape, plus a collection of refurbished, professional-quality playback equipment including Studer tape decks and TASCAM and Nakamichi cassette decks. Staff have received overseas training in tape assessment, preparation, triage, optimal playback and digitisation. As a result, most digitisation is carried out in-house, using high-quality sound cards with regular equipment calibration and alignment checks. Analogue audio is captured in Broadcast Wave Format at 24-bit 48kHz for cassettes, 24-bit 96kHz for open-reel, and up to 24-bit 192kHz for discs. Any original digital audio is archived in Broadcast Wave Format at its original resolution. The use of this format allows MD5 hashes (for performing checksums) and metadata to be stored within the archive file. All this data is stored on a 16TB NAS and LTO-5 tapes, with copies on the university's SONAS central mass storage system, with robotic tape retrieval and emergency power systems. It might seem like a lot of effort to go to, but some of the people in the Archive are Kiwi icons. Names like Dame Anne Salmond, Dame Judith Binney, Sir Hugh Kawharu, Sir Robert Mahuta, Pita Sharples, Tainui Stephens, Bruce Biggs and Meryn McLean may mean little to anyone outside New Zealand. But they're part of this country's history, and their voices speak volumes in ways no written transcription could capture. Thanks to the Archive, they can speak to future generations too.